Callum Patton celebrates his goal for Whitley Bay in the FA Cup draw with Norton & Stockton Ancients. An equaliser four minutes from time denied Whitley Bay victory in their FA Cup extra preliminary round tie against Norton & Stockton Ancients. On a warm and sunny afternoon at Hillheads, the visitors looked much the livelier side in the first half and they took the lead after just seven minutes when David Mitchell was allowed space on the right edge of the penalty area to fire home an excellent shot from 20 yards, the ball flying past Tom Flynn into the top corner. Whitley were looking shaky at the back and they conceded two free kicks in rapid succession as passes went astray in the defensive third of the field. When they broke forward, Callum Patton saw a free kick saved and then Callum Munro broke through the Norton midfield but his final shot was easily saved by keeper Pentony. The visitors were producing some robust challenges and Mitchell was cautioned for a poor tackle on Patton, then Robertson was stopped in his tracks by a clumsy challenge that warranted a caution. Midway through the half, a shot from Chris McDonald was fumbled but pushed wide of the post as Whitley tried in vain to find the equaliser. Shortly before the interval, Norton’s James Wilson got a low shot on target but Flynn was equal to it and made a comfortable save. Whitley came out for the second half looking more purposeful, and after just three minutes, Andy Robertson got a powerful shot on target and Pentony needed two attempts to gather the ball. A minute later Whitley drew level when Robertson raced away down the right and when he crossed into the box, Patton rifled the ball into the net from ten yards. The goal lifted the spirits of Bay players and fans, and the Norton goal came under real pressure. Patton crossed for Robertson and McDonald to see their shots blocked, and then Aiden Haley had an effort pushed wide. Two minutes later another good build up left Haley with a chance but he blazed the ball high over the bar. 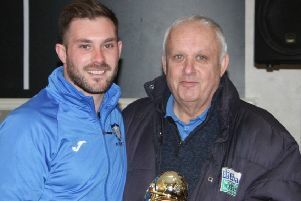 On the hour, Whitley brought on striker Adam Shanks, married just 24 hours earlier, but in a late change of plan, the player leaving the field was defender Richard Flynn, who hobbled off after suffering a knee injury. Whitley kept up the pressure and when they won a corner on the right, the ball was played to McDonald, whose cross into the box was allowed to run free and just four minutes after coming off the bench, Shanks had the simplest of tap in goals to put Whitley in front. Norton were struggling and a third goal would surely have put the game beyond them. McDonald was denied by a late offside flag then Robertson went close from Haley’s cross. Whitley should have made the game safe but with only one goal in it, the visitors were still in with a chance, and four minutes from time, with Whitley failing to press home their advantage, Norton seized their chance from a right wing corner, defender Dale Elgie levelling with a header despite substitute Dillon Blake doing his best to keep the ball out. The teams will meet again on Wednesday evening at Norton and Whitley will need to produce an improved performance if they are to progress to the next round and collect the £15,00 prize money. Whitley Bay: T Flynn, Munro (Blake 79), Allen, Wilkinson, R Flynn (Shanks 60), Anderson, Haley, Fowler, Robertson, Patton, McDonald. Subs not used: Fryatt, Mitchell, Potter, Hall, Hammond. After the game, Bay manager Ian Chandler said: “It was a very strange game because they only had three shots on target all game but scored from two of them. “We struggled in the first half; in the second half we played OK.
“We just couldn’t get that third goal when we were 2-1 up. “We had two or three good chances but after that came the sucker punch. We had a couple of injuries and Richard Flynn coming off didn’t help us.